It doesn’t feel like the Christmas season without a visit to the Redford to watch a Christmas classic. 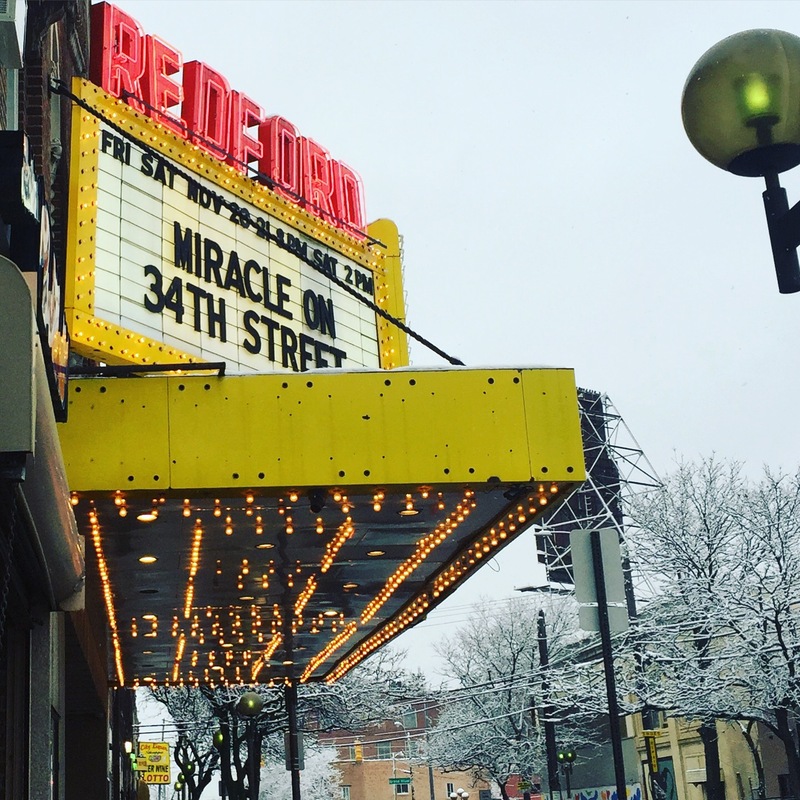 The season began early for me this year, as I visited the Redford to watch one of my favorite holiday films, Miracle on 34th Street, the weekend before Thanksgiving! A film appropriate for both holidays (and therefore appropriate for viewing any time between Halloween and the New Year), Miracle on 34th Street tells a story of believing. Doris Walker (Maureen O’Hara), single mother of one daughter (Natalie Wood), works for Macy’s as a director of special events, including the annual Thanksgiving parade and in-store Santa visits during the holiday season. When her parade Santa turns up drunk, Doris turns to a mysterious whiskered man (Edmund Gwenn) who claims that his name is Kris Kringle and he’s the real Santa Claus. “Kris” does so well in the parade that he’s invited to play Santa at the main store in New York City. He’s a great success, bringing joy to the children and helping their parents find the perfect gifts, too. But his insistence that he is really Kris Kringle causes problems. John Lauter, whose name you may remember from my Redford screening reports of He Who Gets Slapped and Pandora’s Box, provided wonderful organ performance pre-show and at intermission, filling the audience with the Christmas spirit. The film was also preceded by a cartoon, the same wacky-but-lovable Rudolph short that played before the Christmas Vacation screening I attended last year. As for the film itself? Fantastic, as always. Edmund Gwenn gives a truly stellar performance, and young Natalie Wood is perfect in her too-smart-for-her-age, outspoken child role. One performance that really struck me upon seeing the film on the big screen was that of Maureen O’Hara, perhaps because she had passed away just the month before the screening, or perhaps simply because she was such a fantastic actress and I was seeing one of her films on the big screen for the first time. Regardless of the reason, it was wonderful to watch her. Miracle on 34th Street is the type of holiday film that brings you back to childhood, full of Santa belief and Christmas magic. Much like Doris, the viewer is taken on a journey from skepticism to Christmas spirit. A real family classic, and a delight to watch at the Redford. Nice to see a pic of the Redford with snow in the background! I keep forgetting to ask: whenever you’ve visited the Redford for a revival screening, has the attending crowd been a good one (lots of people), or is it more like just a handful of patrons scattered here and there? Yes, the crowds are usually very good! Many of their special events have sold out in the past, too — the ones with guest speakers, and the David Bowie double feature they ran last Friday, for example. The lightest crowds are for silents, but even then there are more people than you’d expect.